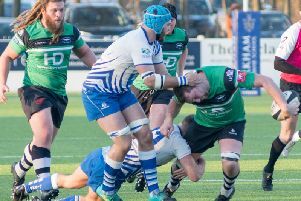 But even he concedes that his side face “two massive games” in the next couple of weekends – a visit to fourth-placed Hinckley tomorrow, followed by a home date with National League Two North leaders Hull Ionians. There will, however, be cause for hope in that Hinckley have slipped from top spot to fourth since the beginning of October, losing three of their last five fixtures. On the other hand, they have won all six of their home games in an overall record of eight victories and three defeats. Hoppers climbed to their highest position of the campaign last Saturday – ninth place – after their fourth win out of 11. But they are still looking for a first away success at the seventh attempt. They do hold one record currently, however – the most try bonus points (nine) and most losing bonus points (five). They last played Hinckley two season ago, winning at home and losing away. With a few late fitness checks to make, Hoppers have named a 24-man squad, which includes lock Chris Roddy, who has been out since pre-season. Still not quite ready to return from injury are Teddy Leatherbarrow, Alex Hurst and Scott Jordan. Fylde, back up to sixth place, face a trip to Chester, who have moved up to second in the last couple of weeks. In the North Premier League, bottom club Vale of Lune are at home to second-placed Billingham, who have won nine and lost only at Rossendale. The NorthEasterners are on a run of five successive victories as they make their first-ever visit to Lancaster. 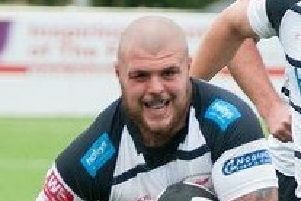 Vale’s four-try bonus last Saturday brought them level with Wilmslow and one behind Kendal in the bottom three, but they still have a solitary draw to show for 10 outings so far. Life doesn’t get any easier at Powderhouse Lane, with selection having to be delayed while the availability of several players is confirmed, including Jordan Dorrington, Damon Hall, Ollie Jacques, Harry Fellows and James Robinson. Hoppers (from): Cave, Crow, Trueman, Stott, Fitzpatrick, Spence, Ward, Davidson, Squirrell, Gough; Mabaya, Miller, Millea, Altham, Purcell, Howard, Procter, Arnold, Roddy, Murray, Birch, Trippier, Edwards, Lamprey.